A simple molecule in the atmosphere that acts as a "detergent" to breakdown methane and other greenhouse gases has been found to recycle itself to maintain a steady global presence in the face of rising emissions, according to new NASA research. With the rise of methane emissions into the atmosphere, scientists historically thought that might cause the amount of hydroxyl radicals to be used up on the global scale and, as a result, extend methane's lifetime, currently estimated to be nine years. However, in addition to looking globally at primary sources of OH and the amount of methane and other gases it breaks down, this new research takes into account secondary OH sources, recycling that happens after OH breaks down methane and reforms in the presence of other gases, which has been observed on regional scales before. 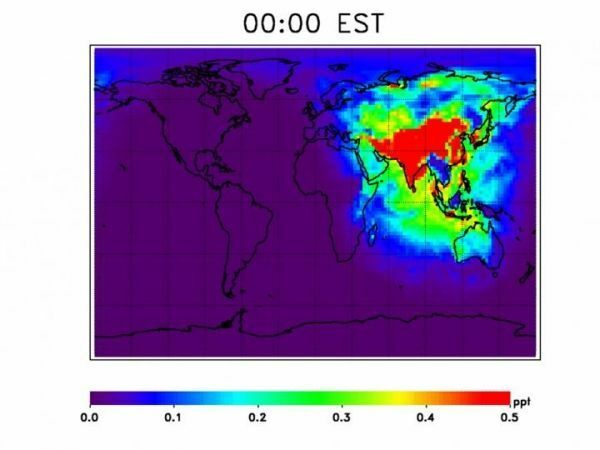 "OH concentrations are pretty stable over time," said atmospheric chemist and lead author Julie Nicely at NASA's Goddard Space Flight Center in Greenbelt, Maryland. "When OH reacts with methane it doesn't necessarily go away in the presence of other gases, especially nitrogen oxides (NO and NO2). The break down products of its reaction with methane react with NO or NO2 to reform OH. So OH can recycle back into the atmosphere."